Dr. Atlas graduated from St. Johns College of Pharmacy and then attended the New York College of Podiatric Medicine, where he was the valedictorian of his class. 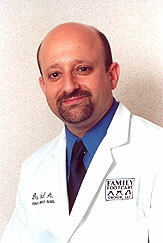 He then served two years as a resident at Wyckoff Hospital, where he became chief resident. He joined Family Footcare Group in 1995. He is board certified by The American Board of Podiatric Surgery, Licensed in both Podiatric Medicine and in Pharmacy by the State of New York. Dr. Atlas is currently a Podiatry staff member at Catskill Regional Medical Center, Orange Regional Medical Center , and the Hudson Valley Ambulatory Surgical Center.